Mort Kunstler Handsigned and Numbered Limited Edition Giclee on Canvas:"Buffalo Soldiers of the West"
About the Art: After the Civil War ended, the army sent several regiments into the West to keep the peace. 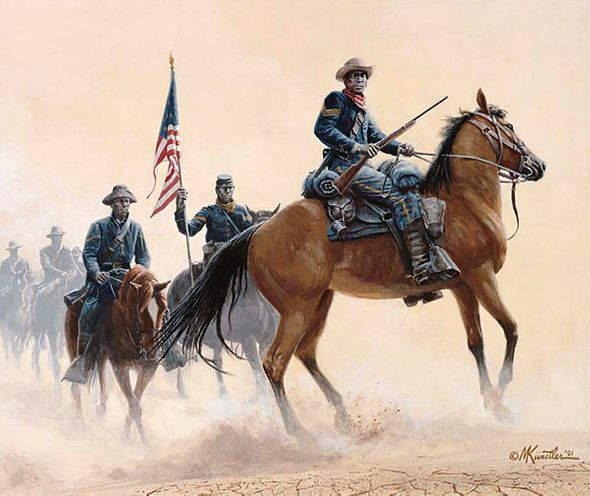 Among them were regiments of black soldiers, including cavalrymen whom the Indians called "buffalo soldiers." One of their notable feats was the rescue in 1868 of Major Forsyth's men at Beecher Island.